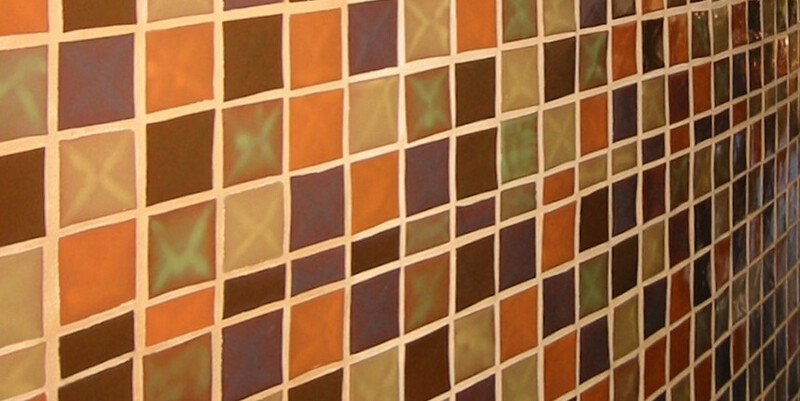 Whether you are searching for restaurant tile or backsplash for the bathrooms for your business, the 3×3 tile design is ideal because it is available in over 300+ colors and glazes. This 3×3 pattern can be as subtle or as vibrant as you want it to be once you decide on the colors and pattern layout. You can choose which colors you want to be repeated in the pattern. Shown in the picture below are the 3×3 custom ceramic tiles in a red clay body with low fire line glazes. In the center, you can see how custom cuts would look for this tile design. We can add some custom cuts throughout your design to make it stand out. To provide our clients the best possible experience, we only work with appointments because we give each customer one-on-one attention. Contact us today to discuss the potential ceramic tile patterns we can create with the 3×3 tiles.